One of the most talked about, acclaimed and successful films ($97 million at the domestic box office) of 2010, The Social Network arrived on Blu-ray several days before the Golden Globe Awards, at which it garnered Best Picture, Best Director, Best Screenplay and Best Score statues as well as two nominations. The movie went on to be nominated for a bunch of Academy Awards too, but was shut out of the biggest prize, taking home Best Editing, Best Score and Best Adapted Screenplay. A dramatized (and some say fictionalized) biography of the juggernaut known as Facebook (500 million members around the world and still counting) and its founder, 26-year-old former Harvard student Mark Zuckerberg, the movie was directed by David Fincher (Seven) and written by Aaron Sorkin (TV’s The West Wing), based on the best-selling book The Accidental Billionaires by Ben Mezrich . We’re talking about a blue-ribbon team of creators here, and they’ve made a very intelligent, professional and well-structured piece of entertainment. 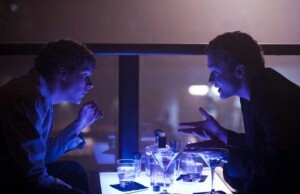 Fincher and Sorkin’s strengths leap to the fore in the film, as it jumps back and forth between the early 2000s at Harvard when the socially awkward Zuckerberg (Jesse Eisenberg, Solitary Man) and his fellow collegians first develop Facebook and a more recent time that finds Zuckerberg being sued by said “colleagues” for stealing their ideas and finagling them out of the now multi-billion-dollar business. Shooting with the high-definition Red Camera that he has embraced over the past decade in such films as Zodiac and Panic Room, Fincher plays down his usually dynamic visual panache and color palette and opts for a more muted design to allow more headspace for Sorkin’s screenplay. Sorkin’s rapid-fire dialog is at its best when thwacked back and forth by two actors playing a game of verbal tennis, and it certainly works in The Social Network. All technological stuff and business speak, meanwhile, sounds as appealing as it ever has in a mainstream film. Also, the work of both gentlemen looks and sounds outstanding in the high-definition Blu-ray presentation. The solid cast of supporting players — including Andrew Garfield (The Imaginarium of Doctor Parnassus) as Zuckerberg’s partner-turned-foe, Justin Timberlake (Alpha Dog) as the seductively hard-partying Napster founder Sean Parker and Rooney Mara (The Winning Season) as the ex-girlfriend that Zuckerberg can’t get out of his mind — are excellent, but it’s really all about Eisenberg. His wired-up, eyes-a-darting portrayal presents Zuckerberg as an insecure artist who paints with computer programs and wants to be recognized for the technological canvasses he creates. His Zuckerberg is a complicated, quite-modern character who warrants some sympathy, yes, but as he drops his friends and business partners because he thinks they might have done him wrong along the way, he’s also far from innocent. The Blu-ray has lots of special features, including two separate commentaries: One with Fincher and the other with Sorkin and members of the cast. As he usually does in his commentaries, Fincher talks extensively about the physical aspects of the production — lighting, casting, location work and so on. He comes down particularly hard on Harvard University, claiming they didn’t do much to assist in the making of the film. “They weren’t very helpful,” he insists. “They sandbagged us, and they were f-ing atrocious as far as what they would allow us to do.” Ultimately, most of the campus scenes were shot at Johns Hopkins in Baltimore. The second commentary isn’t as informative, probably because there isn’t enough of Sorkin. Most of the chatter is taken up by various cast members, who mainly laugh a lot and talk about how brilliant the filmmakers are. Among the other bonuses are an exhausting feature-length making-of documentary that, again, focuses on the movie’s details and doesn’t delve into the ramification or debatable factual accuracies that everyone else seems to be talking about. There’s also a handful of featurettes on the film’s editing, visual style and music.